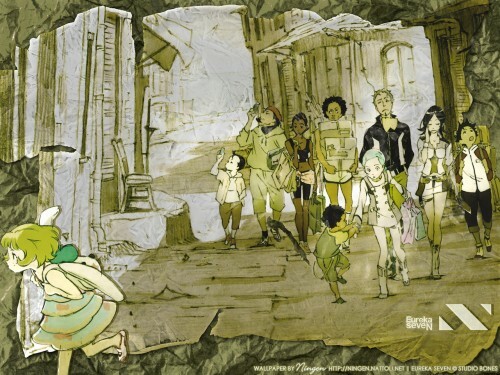 This is my most recent Eureka Seven wall, and it's likely there will be many more on the way o_0 Because the original image didn't have much color variance, it inspired me to go with an old paper look, having the characters stand out a bit from the background, with Maeter leaving the page, just to play with the style a bit. I really love the colors and shadows and that "crumpled paper" feeling is awesome! Excellent job! This wall is really such a good scene all out. The texture is most excellent, and I also love the feel to it. Great work Nat. Oooh, I like this style. Every character has a distinctive pose as well. The colours also go well together. All and all a very good job indeed. Very nice Eureka Seven wallpaper. I like it, it has a lot of "style." The colors look good, as does the background...err...both backgrounds. A crumpled, torn piece of paper...interesting. Great texture use, excellent presentation...I like it. Thanks for putting all that work into it and then uploading it for us to enjoy. this is one of the series that make me realise how much i love draw and anime!i definitly love it!